JPEG file (1600×1200 pixels; 887KB). 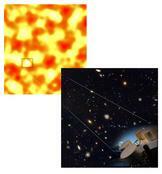 Seeds of galaxy clusters. 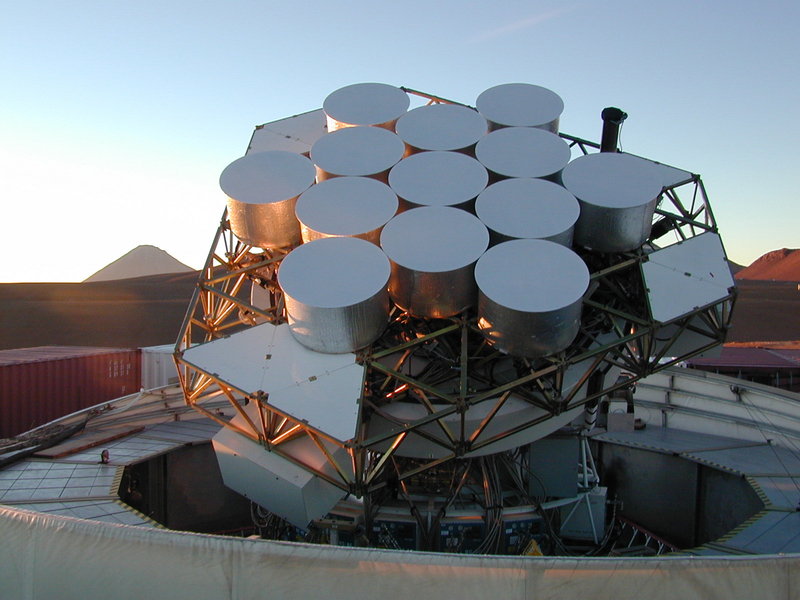 The CBI polarization results provide clear evidence of the motion of the remotest seeds of galaxy clusters in the very early universe. These polarization results combine high resolution with high sensitivity which allows us to see fine details of the radiation from that epoch and to compare in detail the total intensity with the polarization results. We find that the polarization is “out of step” with the total intensity, which is an indication of the motion of these seeds. At the upper left is shown a total intensity CBI image of the microwave background in which the variations in color indicate variations in temperature, and hence in density, at this remote epoch, 13.8 billion years ago and just 400,000 years after the Big Bang. These variations in density are the seeds that gave rise to clusters of galaxies and all the variety of structures that we see in the nearby universe, including galaxies, stars and planets. At the lower right is shown an image of the universe after galaxies had formed (Hubble Space Telescope image, courtesy of NASA). TIFF file (1623×1743 pixels; 8.1MB). Polarization. The new results of the CBI are based on a property of light called “polarization.” This is a property that can be demonstrated easily with a pair of Polaroid sunglasses. If one looks at light reflected off water (such as on a fish pond) through such sunglasses and then rotates the sunglasses, one sees the reflected light varying in brightness. This is because the reflected light is polarized, and the Polaroid sunglasses only transmit light whose polarization is properly aligned with the Polaroid. TIFF file (1311×941 pixels; 3.5MB). Power spectra. The CBI polarization results are found to fit the predicted polarization curve (green line) which is out of step with the total intensity curve (red line): the peaks in the total intensity curve line up with valleys in the polarization curve, and vice versa. The patterns in the temperature were more sensitive to the compression of matter when the “first light” was released, while those in the polarization were more sensitive to how it was flowing. The two are predicted to be intimately related and confirmation of this was one of the main findings if the CBI team, lending support to the inflationary paradigm. 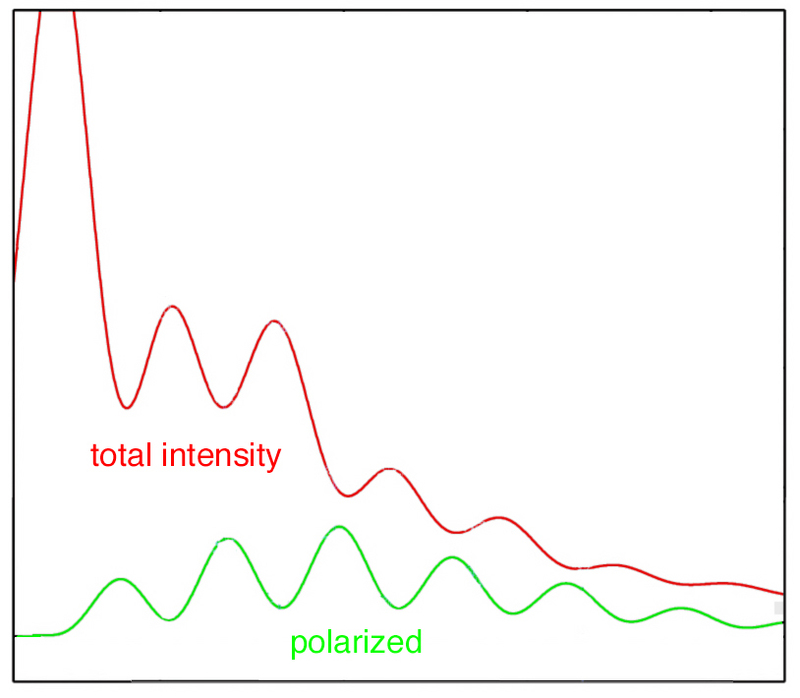 The curves are not on the same scale: the polarized power is a hundred times weaker than the total intensity, so the polarized curve has been magnified for clarity. JPEG file (814×710 pixels; 154KB).